← What are you doing for the summer? Wow. Caught the movie ‘Enigma’ again on tv last Sunday night. I knew the story, but Id forgotten just how good it was. I enjoyed the film so much I bought the book on Monday in order to re-read it. What did I discover? I hadn’t read the book at all. Oh joy! 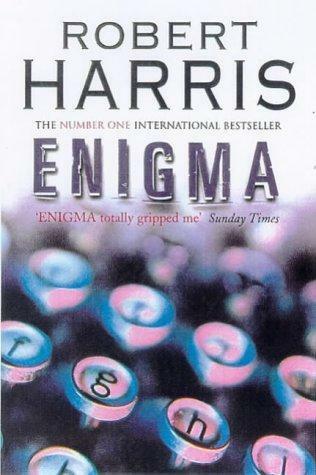 Robert Harris is an superb historical novelist and this has to be his masterpiece. Superbly written, well-informed, a fantastic plot – it simply has everything. Even the love angle is utterly convincing. As for the maths – the description of the codebreakers and their methods is superb. I think the description of the loneliness of the mathematican is the best I’ve ever come across. Most important of all, the story just rushes along. It basically concerns the famous work at Bletchley Park in WWII, as the best and the brightest of Britain struggle desperately to break the Navy, Luftwaffe and Werhrmacht codes using a combination of guesswork and an early computer. The hero of the book is young mathematician Tom Jericho, which I presume is a stand-in for computer genius Alan Turing. Every now and then, the German ‘weather book’ changes, and they’re back to zero. The description of the codebreaking is superb, as is the serious subplot – when the Allies evesdrop on German reports of the Russian Katyn forest massacre, a British codebreaker of Polish origin decides he doesn’t want to be allied with Russia and attempts to leak the codebreaking secrets to the Germans. Clever plot – perhaps it really happened? Apart from a great plot, it’s good to see codebreaking get recognition it deserves. Just last week, I read an article on the Battle of Britian that ignored the role of science, as usual.Yes, the pilots were brave – but important advances in both code-breaking and radar also gave the Britian an edge in that vital battle..
A super read and a super introduction to the world of computing. Go and get it now. Have you read Neal Stephenson’s Baroque Cycle? No I haven’t…will have alook. Apropos what?